How to buy the best rolling papers flavor? Where to find cigarette papers rolling flavored? 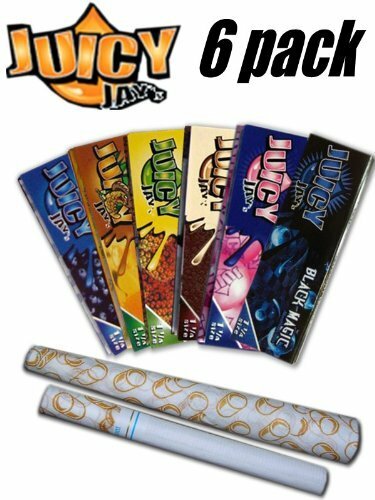 Juicy Jays Flavored Rolling Paper Assortment (6 Pack) + Beamer Smoke Sticker! Juicy Jays famous flavored rolling papers add brilliant taste that compliments your Legal herb smoking experience! Triple dipped flavor makes the awesome rolling papers sweet and, well... Juicy! This amazing variety pack includes 6 packs of our best selling Juicy Jay Papers in an assortment of flavors. Each pack contains 32 - 1 1/4" Sugar Gum Glue Papers for a total of 192 papers that are so tasty you will want to squeeze the taste out of the papers and in to a glass to drink it! Not intended for tobacco use; for legal herb use only.